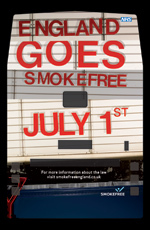 On May 14th 2007, six weeks before the Smoke Free law was officially introduced a series of television adverts went out which were aimed at informing individuals of the upcoming changes. 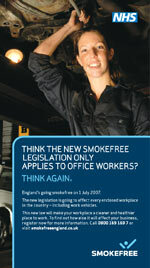 These adverts featured a male actor walking through and enjoying smoke free zone that were once clouded with smoke, such as a garage, cafe, pub etc. 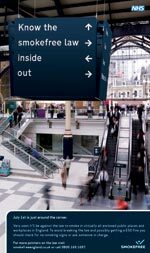 The television adverts worked hand in hand with a number of other campaigns all aimed at raising awareness such as online adverts, information in the press, billboards and more. 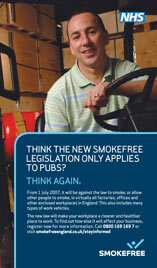 Throughout January and February 2007 on the lead up to the 1st July launch of the Smoke Free law additional online and press advertising ran which was focused at building awareness amongst business owners. 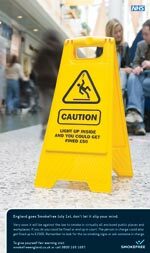 This campaign encourages business owners to register in order to receive official guidance on the legislation and their own responsibilities as part of that. 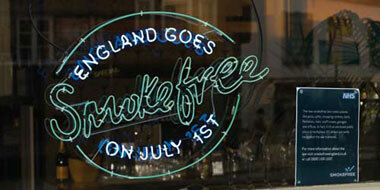 A follow up campaign during May and June of 2007 which incorporated additional radio and local press advertising was put in place as a reminder of the 1st July launch date and to share important information.